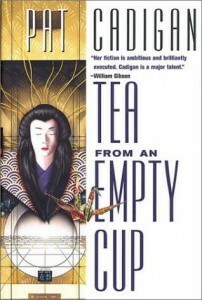 Tea from an Empty Cup, Pat Cadigan, Tor, 1998, $22.95, 254pp. The speculative fiction of the 1980s and the early 1990s by and large treated Japan as an economic powerhouse that threatened to subsume the United States and Europe — mirroring, unsurprisingly, the view that prevailed in the culture at large. Japanese companies outperformed their American counterparts in the marketplace, at times even buying up their flailing and failing rivals. Cultural icons such as Rockefeller Center became Japanese property. The Japanese economy was booming, while Europe and the United States struggled in the aftermath of funding the defense systems of the Cold War. From William Gibson’s Neuromancer to Neal Stephenson’s Snow Crash, the clear assumption was that the future belonged to Japan. In the latter part of the 1990s, things have changed: the United States is riding an unprecedented wave of prosperity while Japan is caught in a financial crisis that covers the whole Pacific Rim. 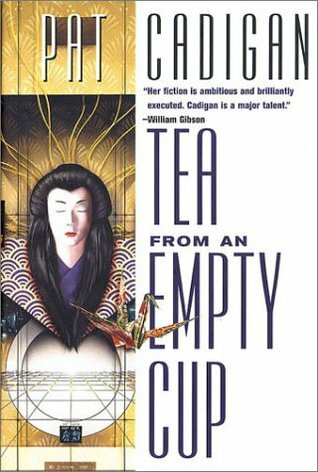 Speculative fiction has responded (as it should) to these altered circumstances, nowhere more clearly than in Pat Cadigan’s new novel, Tea from an Empty Cup, an expansion and grafting-together of two earlier stories about the future of Japan which were originally published on Omni Online. Instead of the Rising Sun, Cadigan shows us a Japan where the sun has set on its glory days. The plot of Tea from an Empty Cup centers on the murder of an anonymous Artificial Reality (AR) junky and its investigation by policewoman Dore Konstantin. The victim, whose throat has been cut from ear to ear, was accessing the AR at the time of his death — and was being murdered there as well. Everyone knows, of course, that what occurs in AR cannot affect the real world, but Konstantin is starting to wonder: Rumors of similar AR deaths have been circulating that indicate something unusual is going on. Intermixed with Konstantin’s investigation (which occurs in numbered chapters under the title of “Death in the Promised Land”) is a second storyline, a search for the missing Tomoyuki Iguchi by his friend (and would-be lover) Yuki, told in chapters under the heading of “Empty Cup.” Yuki fears that Tom has become one of the many lost Joyz Boyz, young men who exchange their bodies for high-speed AR access. The hunt for friend and murderer by Yuki and Konstantin spiral around each other as they each pursue their searches into post-apocalyptic Noo Yawk Sitty, an AR that promises fun for all, as long as you have the resources to pay for it. Survival in AR requires a mental dexterity that can easily drive someone insane, and neither woman is particularly adept at navigating the make-believe world. Both must learn how to survive in this new setting before they can make progress on their quests. It is in the heady rush to the end, as the stories spiral around each other faster and faster, like water down the drain, that the novel is at its weakest: Cadigan’s prose becomes more and more concise and we lose some of the depth of the setting and characters that has been established earlier. Tea from an Empty Cup is less densely layered than Cadigan’s previous novels Fools and Synners, but it is filled with the same streetwise characters who know that, when it comes to technology, “the street finds its own uses.” Cadigan’s characters are the ultimate cynics and pessimists, who are nevertheless still surprised when their dim worldview is validated. In this way, Cadigan’s cyberpunk (for this is the subgenre of which she is queen) is different from that of her male counterparts, most of whose visions of the future are equally bleak but whose characters lack this quality of surprisability. Yuki and Konstantin are hardened to their world, but they are still human enough to hope for better. While the flash of Tea from an Empty Cup comes from the same elements as other cyberpunk novels, what makes the story resonate with the reader long after the last page is this vestigial morality in its characters, who are trying to maintain some dignity in a world that is being made before them.